Many people have said to me over the years, "Do you realize everything you are teaching your children with your author birthday celebrations?" You would think by now I would be able to respond without stumbling over my words, feeling slightly embarrassed, and following up with an awkward smile and a "thank you." Maybe after this week's birthday celebration for Lucy Cousins, I will have a better response for the next time someone compliments me. 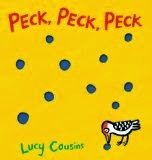 Lucy Cousins is the author and illustrator of the successful Maisy series of picture books, Peck, Peck, Peck (WE LOVED THIS BOOK!) and Hooray for Fish!. 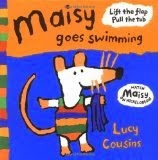 She sees herself much like her popular Maisy character, "Maisy is the sort of person that I am. I had no interest in girly stuff at all when I was a child. I had brothers and I just wanted to do their things." (BookTrust). She may not have been interested in "girly stuff" but she was interested in art. She studied art for six years at the University of Brighton and Royal College of Art. In college, she decided that for her, the best way to use her artistic talent would be to make children's books. She wrote her first book Portly's Hat while still in college and shortly after graduating, her first two books about Maisy, Maisy Goes Swimming and Maisy Goes to Bed were starting to catch on in a big way. One day Lucy Cousins was drawing a variety of animals and something amazing happened. "I drew a mouse. I just saw her character straight away. She sort of came to life for me. I felt I know this mouse. I know what she is like. I know the what sort of things she does. That was how I came to draw Maisy." (YouTube). Her instincts were right on and children have fallen in love with Maisy all over the world. Over 31,000,000 books have been published featuring Maisy in a variety of formats; board books, picture books, concepts books, stickers books and more. (Walker Books). Lucy Cousins was asked How old is Maisy? and she responded by saying she is about 3 years old. "She likes doing all the sorts of things that toddlers like to do." (My Friend Maisy Website). My youngest daughter is about to turn three years old and she loves reading books about her three-year-old counterpart, Maisy. 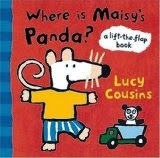 I would pinpoint my daughter's love for Maisy starting with the board book, Where is Maisy's Panda?. 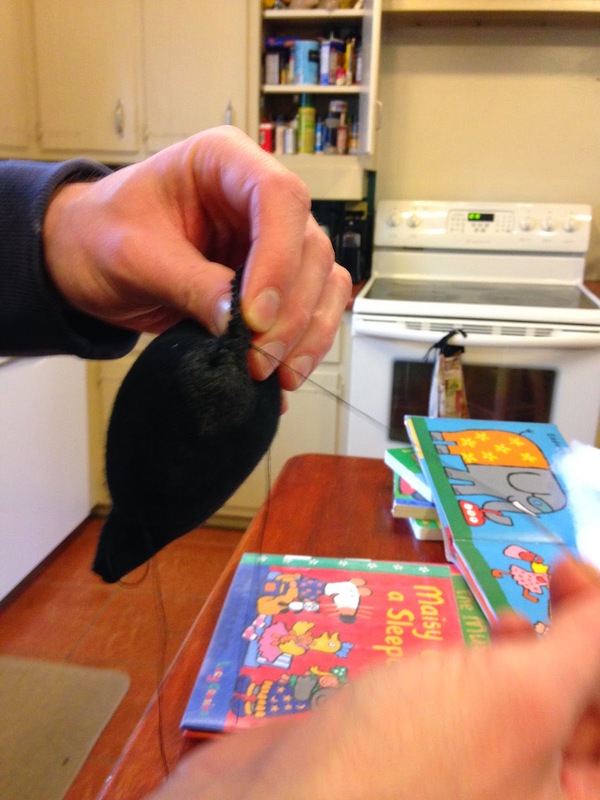 The lift-the-flaps are still fun to open when we read the book. 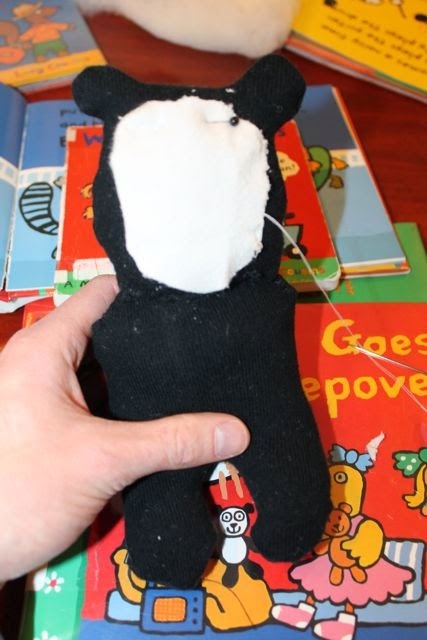 Especially the flap to see if Maisy's panda is in the toilet! This week, I sat down with my youngest daughter one afternoon to read a stack of books by Lucy Cousins. My daughter chose to start with the books about Maisy. As I read the books to her I noticed that my daughter was pointing out Maisy's panda in all of the books. In Maisy Goes on Vacation, Maisy took her panda on vacation, but my daughter noticed that panda only stays in the hotel and doesn't get to go to the beach. 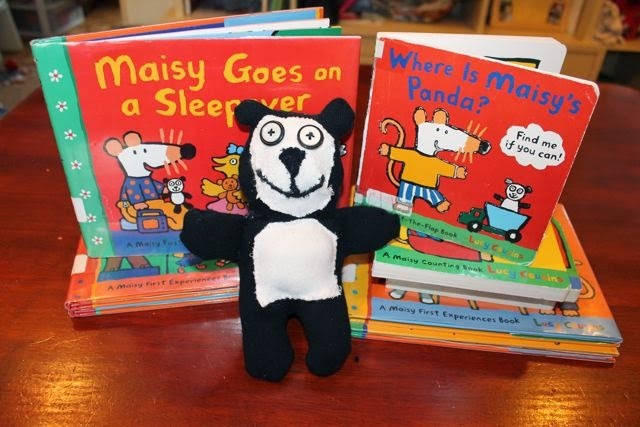 In Maisy Goes on a Sleepover, Maisy's panda goes to the sleepover and stays up late with Maisy's friends. The more my daughter pointed out the panda, the more I wished she had a panda of her own. 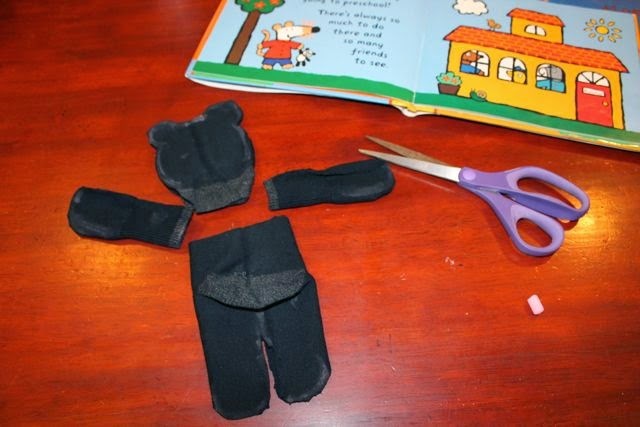 I searched and found instructions on how to make a teddy bear out of socks. 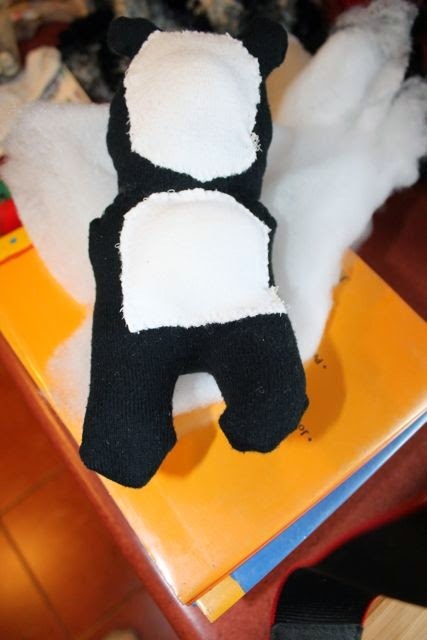 I thought the project looked easy enough and it seemed that I could easily adapt the instructions to make a panda. I explained my idea to my wife and asked if she could help. (She has helped on other sewing projects in the past; Steam Train, Dream Train pillow cases and Pete the Cat art smocks.) However, I quickly realized that our time was limited. If I wanted to do this project it needed to happen while my wife was at work. 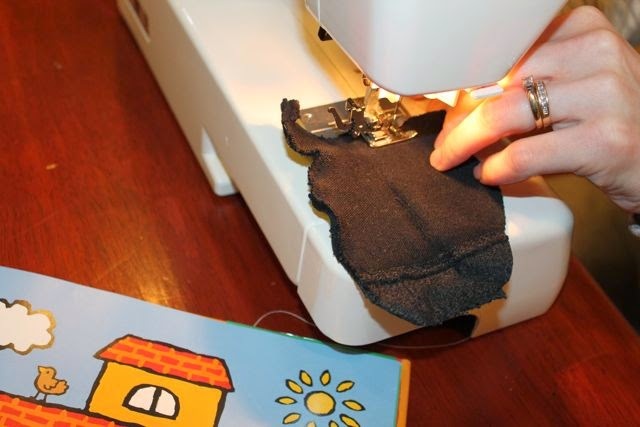 I was on my own to learn how to sew! 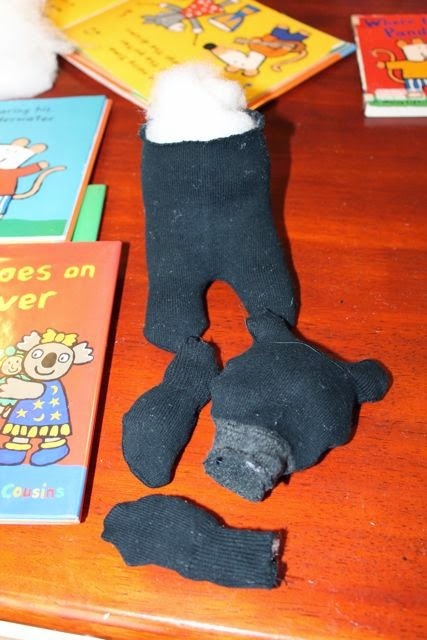 In the series of pictures below, I show how we accomplished making Maisy's panda. If you want more detailed instructions I would recommend following the instructions provided by Rawr. On a black sock, I drew with chalk the head of the panda. 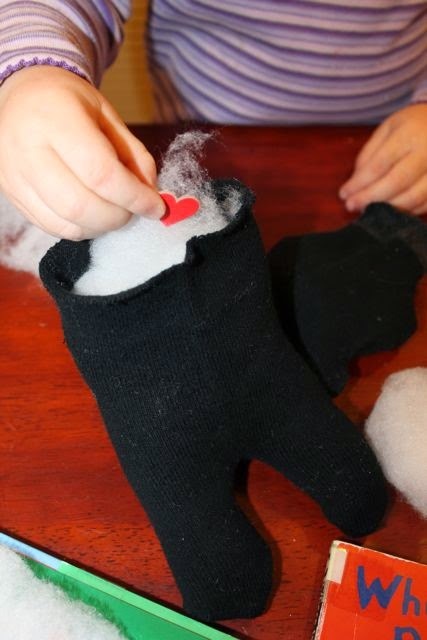 The heel of the sock would act as the panda's bottom. I drew two legs above the heel and near the top of the sock I drew two arms. 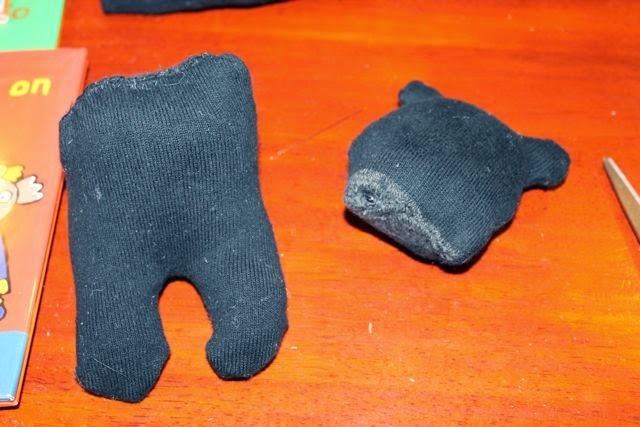 After cutting the sock it looked more like a panda. 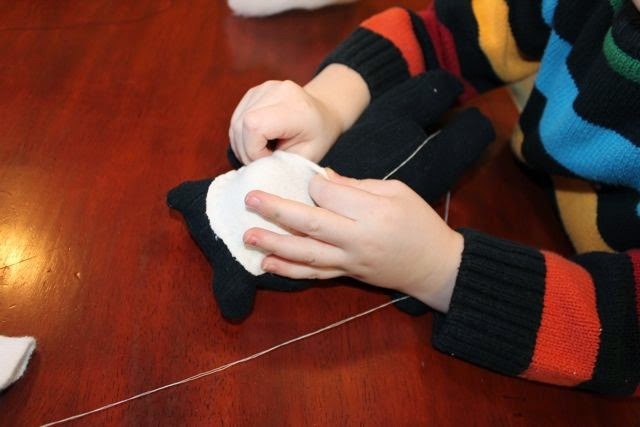 My wife helped sew the edges on the sewing machine the night before I worked on the pandas with my children. I had the young Maisy fans stuff batting into each piece of their panda. I made a cardboard heart to place inside their panda. 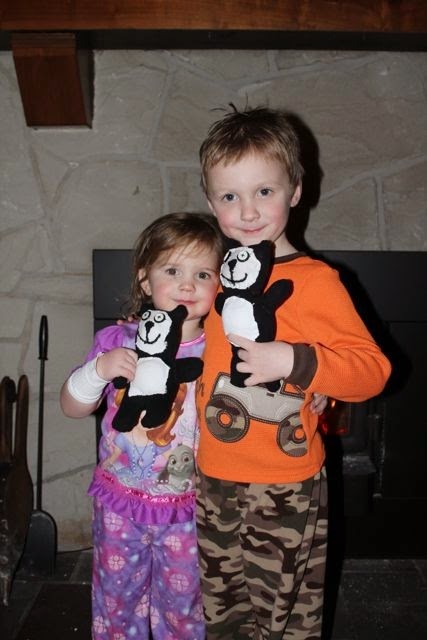 My son later found heart-shaped buttons to place inside of his panda. Actually, I think his panda has 4 hearts! The stuffing went well. It was time for me to sew! 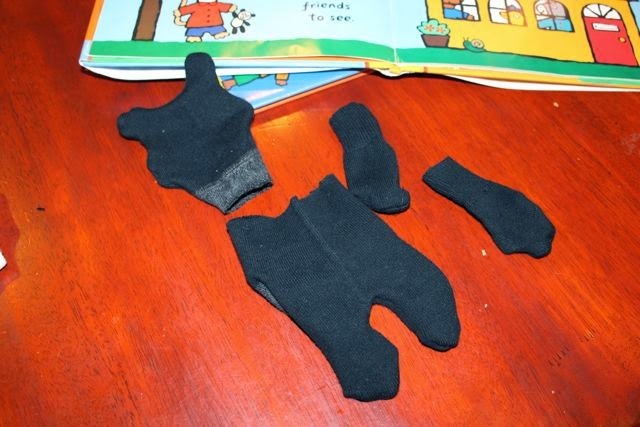 I sewed each part closed; head, body, and arms. 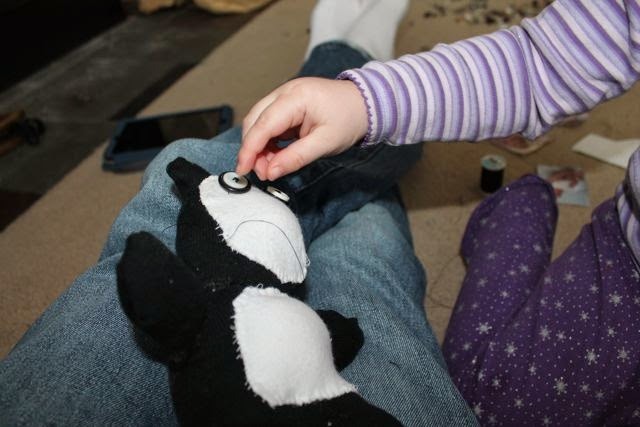 My four-year-old son took this picture as proof that it was me sewing the panda! I was feeling pretty good after I sewed the head and body closed. 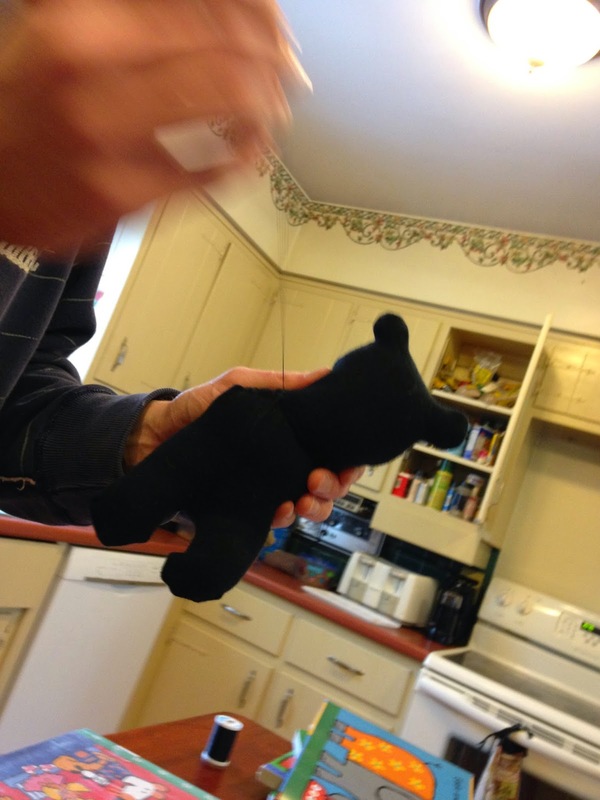 Next, I sewed the head onto the body. 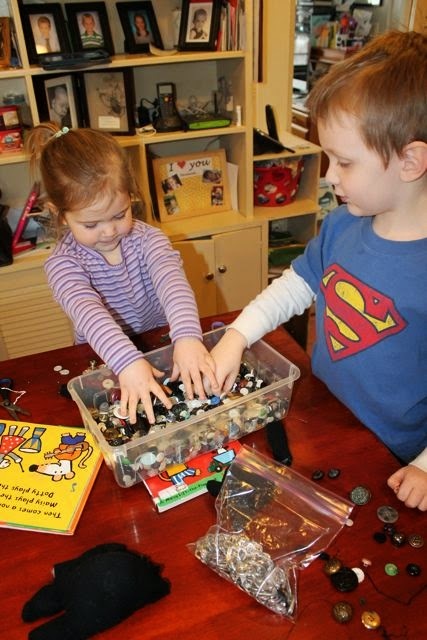 While I was sewing, my children played with our box of buttons! 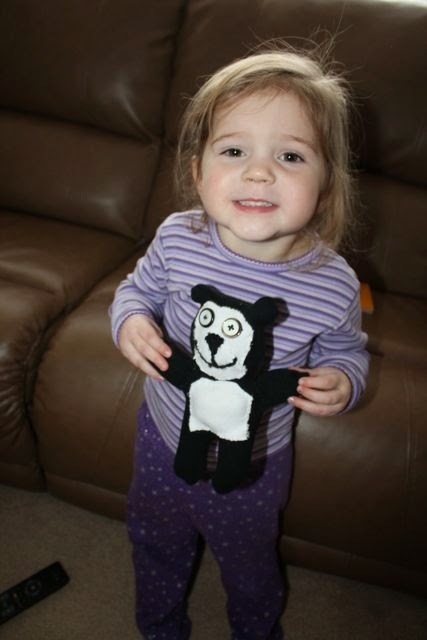 I cut a white oval from one of my daughters old socks to make the panda's face. We stuffed some batting to make a nose before closing up the stitch on the face. 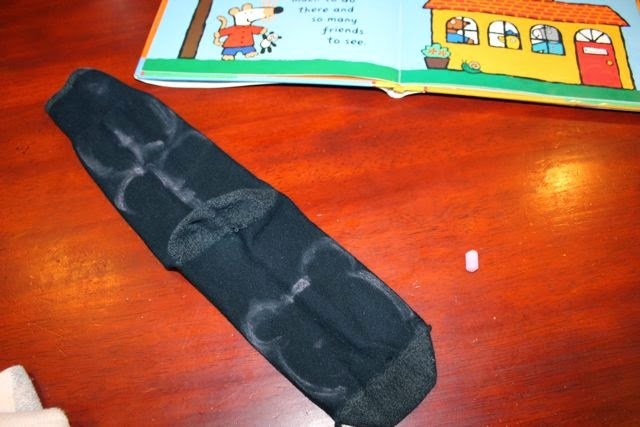 I sewed another piece of white sock for the body. Then, I sewed on the arms. We made a mess looking for just the right buttons for the eyes! I had no idea how to make the nose and mouth. My daughter laid a piece of thread on the face to make a mouth which gave me an idea. I don't have a picture of it but we used a scrap from original cuts to make the nose. 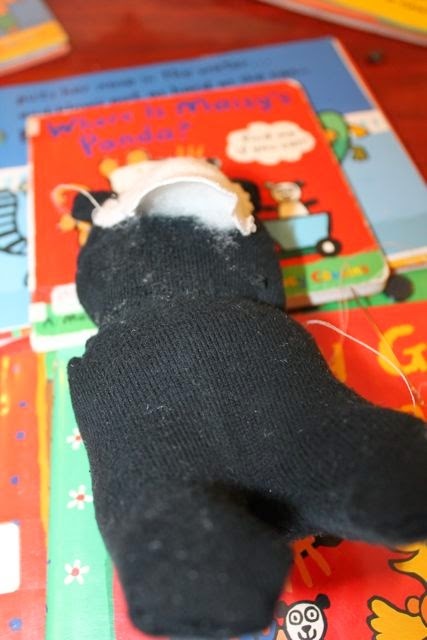 Then, I sewed black yarn on the face to make the smile. My daddy made this for me! I still had one more panda to make. My son helped stuff the batting to make the nose. His panda turned out great, too! Oh, and while I was at it, I mended a pair of my jeans. I do not think I have ever had success with that before. Come to think of it, I now know how I going to respond if someone says, "Do you realize everything you are teaching your children with your author birthday celebrations?" I am going to confidently say without the embarrassment and awkward smile, "Yes, my children are learning a lot, but they aren't the only ones learning." 1. "My Friend Maisy" Website + lots of printables!